In Newscoop, topics are the subject matters assigned by editors and journalists to articles, so that related articles can be identified and displayed together. A root topic can have many subtopics; for example: the sports root topic could have the subtopics football, basketball, and water polo. An individual article may have several root topics or subtopics assigned to it. 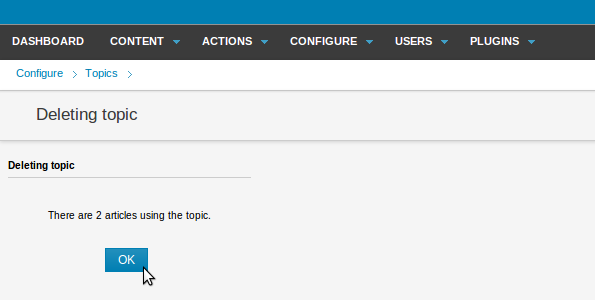 To review or create topics, click Configure on the main navigation menu, then click Topics from the sub-menu. In the Show languages box on the Topics page, click the checkboxes for the languages used in your publications to display relevant topics. Then click the Show button. 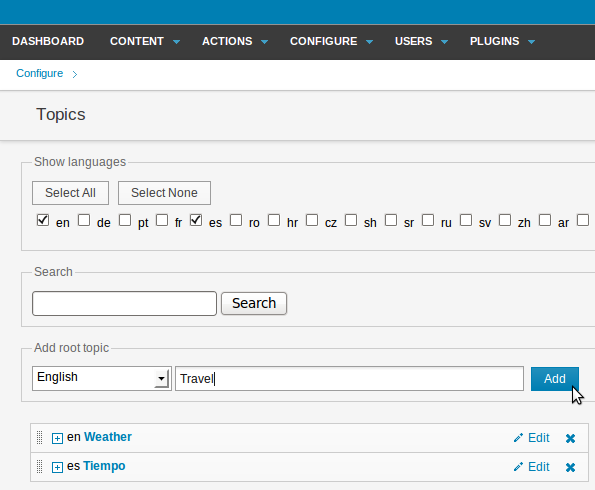 To add a new root topic, select a language from the drop-down menu and enter a word or phrase in the Add root topic field. Then click the Add button. To rename a topic, click the Edit link to the right of the topic or subtopic name. The name row will expand to show the Change topic name field. Update the name, and then click the Save button. You can translate topic names so that they appear in the correct language when a journalist is editing a translated article. 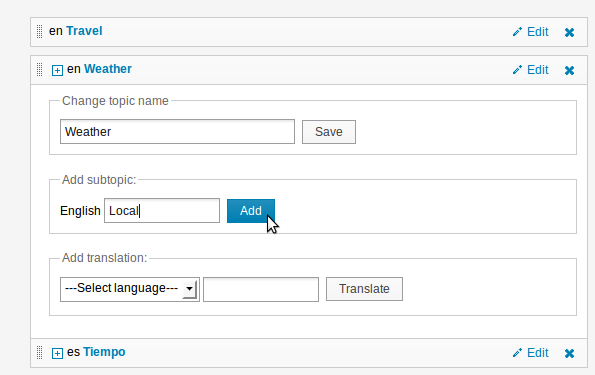 To translate a topic, click the Edit link to display the Add Translation field for that topic name. 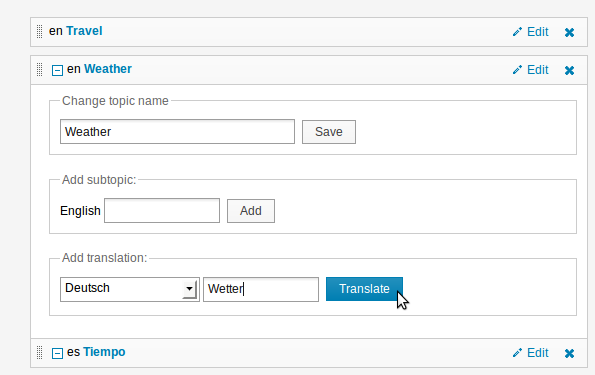 Select the language you are translating into from the drop-down menu, enter the translation of the topic name, and then click the Translate button. 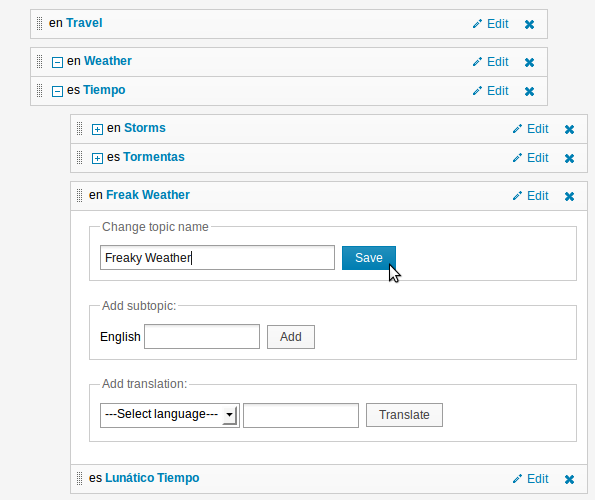 If you translate a subtopic and its parent has not yet been translated, the parent topic will appear in its original language until you translate it. To add a subtopic, click the Edit link next to the existing topic or subtopic you want to put the new subtopic under. Enter a word or phrase into the Add Subtopic field, then click the Add button. The new subtopic will appear underneath its parent topic. Topics can be re-ordered by dragging and dropping, after which you will be prompted to click the Save order button in a pop-up window. You can also click the Reset order button in the pop-up window, if you wish. Any changes to topic ordering that you save may be reflected in lists of topics displayed to the publication's readers. You can delete a specific topic or subtopic using the blue cross icon, on the right hand side of its row. If you attempt to delete a topic currently in use by an article, Newscoop will warn you about this.